Most times you go out for dinner the biggest ingredient, and one of the only ones you can control once you’ve sat down, is your company at the table. This should not be taken too literally as I know you have no choice when dining communal style! Breaking bread. It is a warm concept. Sharing a meal with friends and/or family is one of the greatest pastimes of all civilisations. So I love the name Bread In Common for a restaurant. As you might now expect it is filled with communal tables and bread is a theme (for $2 per person which is a little strange in a way – I’ll get on to that later). 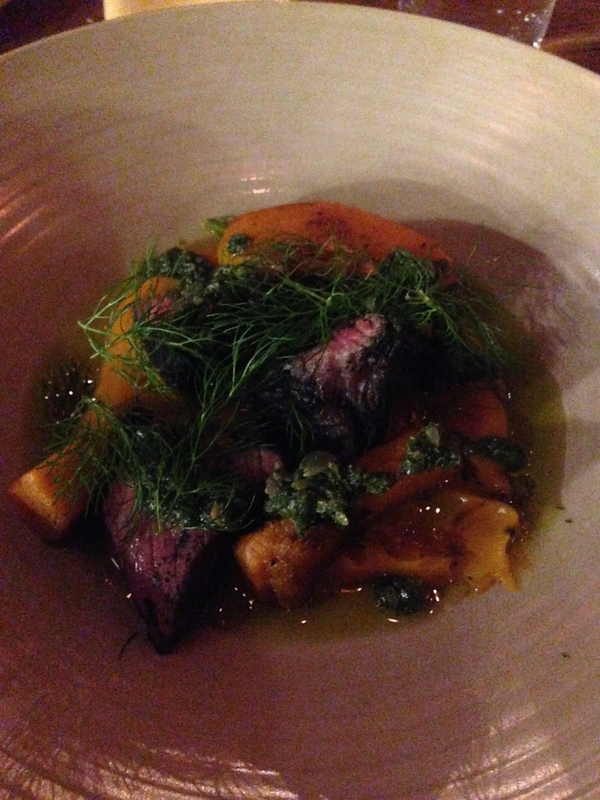 It is well documented that the team of owners who have BIC have many other restaurants in Perth. The one that BIC is most closely based is Il Lido in Cottesloe which is one of my favourite places to eat in Perth so no surprise the formula works for me and I’m in awe of the extensive warehouse stripped back fitout. It is popular on a Monday night so it’s not just me either. One of my best mates rates this as their favourite with packs of energy and enthusiasm, and we have been planning to catch up here for ages. We have a good group for a catch up and before you know it we are digging in to several share dishes. That is the thing to do here – share lots of reasonably priced dishes (think around $15 for veg and around $24 for meat and seafood dishes). The portions are not overly generous but there is, literally, a bite or two each of most between the seven of us. I am a numbers man so let’s say about $2 a bite for the more expensive dishes! Each dish sounds great. The menu is well written and when ordering the service is helpful. Out of what we tried, the hits are the chargrilled chicken, the carrots, the duck fat roasted potatoes and the pork shoulder. 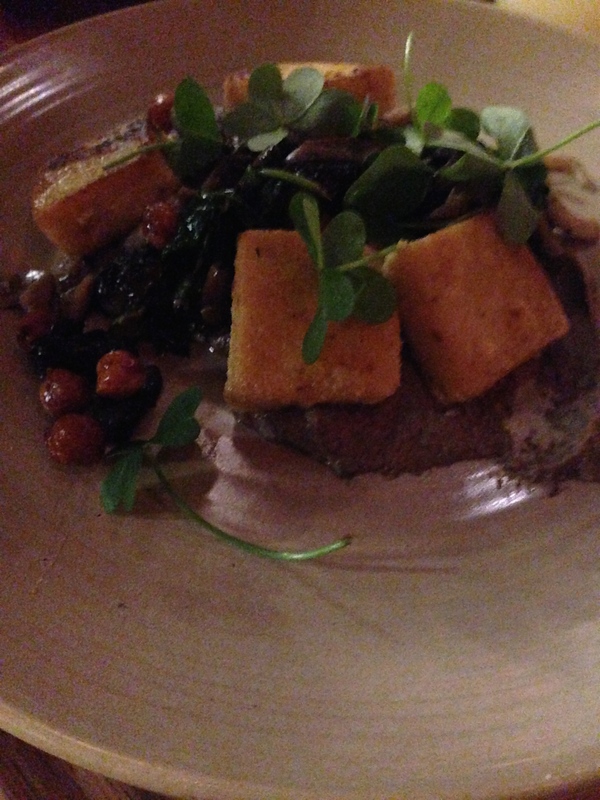 The mushrooms are dominated by polenta (which is not mentioned on the menu?) but are okay and the rump is a miss as it is far too chewy. The cuttlefish was just okay but missed for most of us, especially given it had been talked up by our waitperson. They didn’t bring the beetroot and for some reason made an executive decision on the second chicken dish even though we would have gobbled it up. The corn accompanying the chicken is divine. It is one of the best combinations I’ve tried recently. The duck fat potatoes live up to the promise and are indulgently served with roasted garlic, rosemary and ketchup (aka tomato sauce). 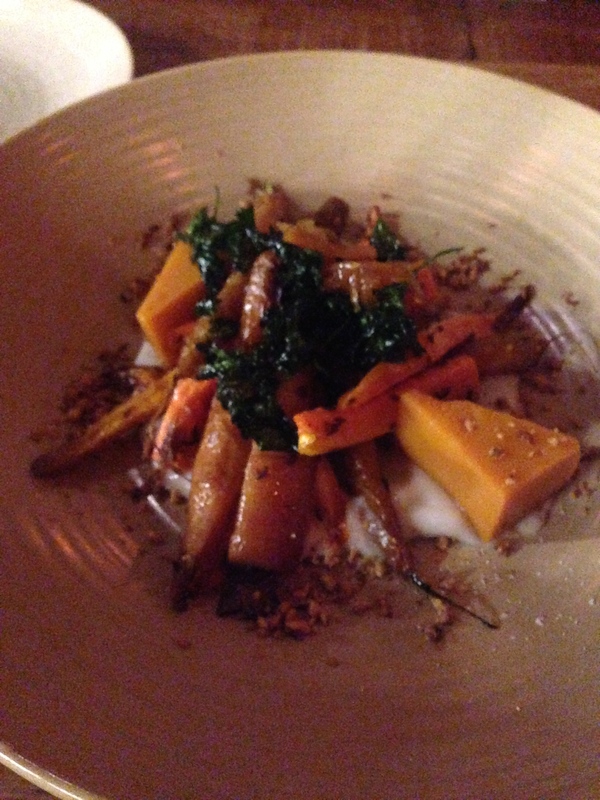 The carrots are beautifully roasted and come with carrot tofu (aka surprise pumpkin) that is soft and tasty. 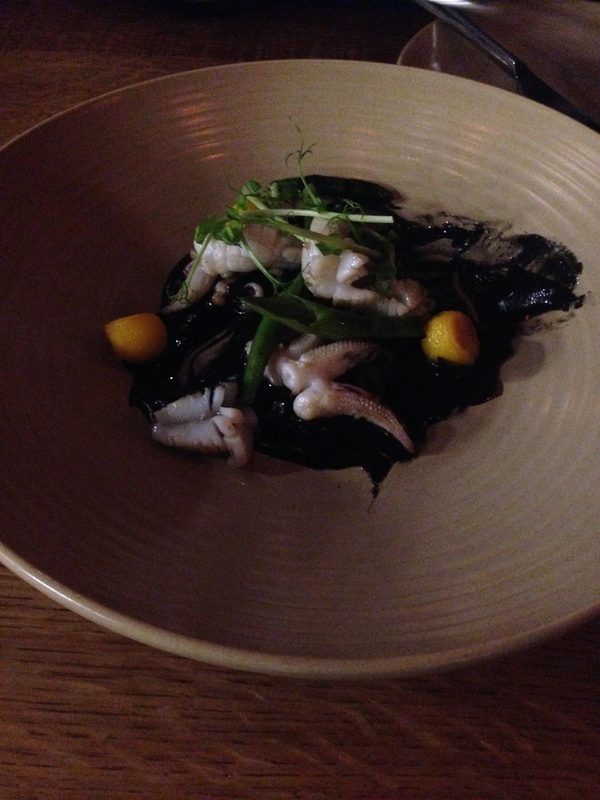 The cuttlefish was strong but not with a rich decadent flavour so it was a little off-putting and strong smelling. The beef is just simply using the wrong cut for what they are trying. We had been here for ages chatting and catching up and it is a great space to do just that over some nice food. The dessert was right for the concept – beautiful bread and butter pudding with a modern touch of burnt toast ice cream that was more playful than anything else. It did have a hint which is all you would want of burnt toast! The pudding was denser than my favourites but was delicious all the same. The collection of owners in these restaurants are making a killing and they deserve to. Their places are always great spaces, well thought out, and normally not taking themselves too seriously. I do need to touch on the $2 bread and $0.50 butter, $0.50 olive oil and $3.50 dukkah. Is there really a need to do this? We each had one piece of bread and I was just confused. They didn’t come back once over a 3.5 hour dinner and offer more so I’m guessing that’s it. It is just tacky for such a great place. Breaking bread doesn’t have a price on it! BIC is a terrific venture, and honours the vibe of Fremantle and it’s local architecture. The feel and effort that are present mean it is going to be part of the dining scene for a long time to come but there are improvements to be made.